The best time of year to divide perennial flowers is early spring just as their new shoots begin to peek up through the soil. That time is right now. Gardeners have different reasons why they might want to divide their perennials. Maybe the plant is getting too old or too big for the space they’ve been growing in. Another gardener may want to build up the number of plants they have to expand their planting. Still another may want to give away hard-to-find plants to friends. From a practical point of view, dividing perennials is most often done because the plants age and their flower displays start to wane. As a perennial plant grows, it adds new growth to the outer portion of the clump of plants. This works fine for the gardener up to a point. Eventually the clump expands so much with new growth that the center of the clump will turn woody and non-productive. That’s when dividing needs to be done to revive the plant. It’s the new growth area of a plant clump that you want to save. You do this by removing the new growth from the old, replanting it and discarding the old portion. Start by using a garden fork to loosen the soil all the way around the plant before you do any actual digging. Then use a garden spade to cut the clump into pieces small enough to handle, usually in thirds or quarters. If you cut too small of a piece, the new plant may not be able to compete very easy with the other existing plants and you’ll spend extra time nursing it through the season. Some fine-rooted perennials like dianthus can be separated just using your hands. For tougher plants you’ll need help from a spade or garden fork. One trick I use is to take two garden forks placed back to back into the root area. Then push against the handles to lever the clump apart. 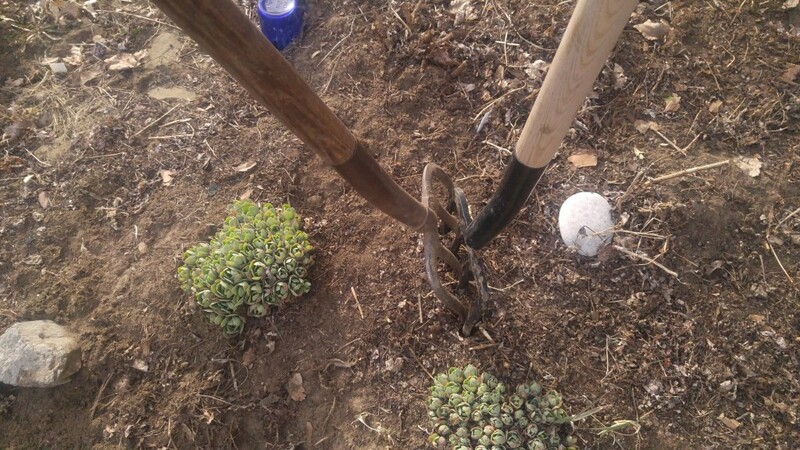 Two garden forks placed back to back can be used to wedge apart stubborn roots. Lift up the cut part of the plant you want to move and clean off all dead leaves and any broken or damaged plant parts. By the way, this would be an excellent time to add compost, fertilizer or any other soil amendments to the area before you set the plants. For fastest plant recovery, plant the clump right away in your newly prepared spot. Set the plant at the same level it was originally growing and water it in well, don’t skimp on this first watering. Take any left over clumps and pot them up to give away to friends and family. You don’t have to be too picky about potting them if the recipient is going to plant them soon. Spring dividing is mostly for summer-flowering perennials like asters or sedum. Those that bloom in the spring, like peonies or columbine are best divided in the fall. In many cases the tree can grow new scaffold branch from existing nearby shoots. It’s the gardeners job to select which shoot would make the best replacement. If you do all your pruning early, you greatly reduce the number of shoots available for growing the replacement branch. Water sprouts are those thin branches that grow straight up from the main branches. During a severe ice storm, ice can add from ten to one hundred times the weight the weight that branches have to support. High winds make it even more hazardous for the trees. By removing water sprouts you drastically reduce the surface area for ice to collect, lightening the load that fruit trees branches have to bear. One quarter to one half inch of ice can cause small branches to begin breaking. Taking off the sprouts also reduces the amount of area for the wind to push against. During a normal year we can expect four or five days when ice accumulates and usually is not enough to do much damage. But every ten to twenty years or so we get a major ice event and that’s when trees get damaged. By doing your fruit tree pruning in two stages you can buy yourself a little extra insurance against major tree damage. 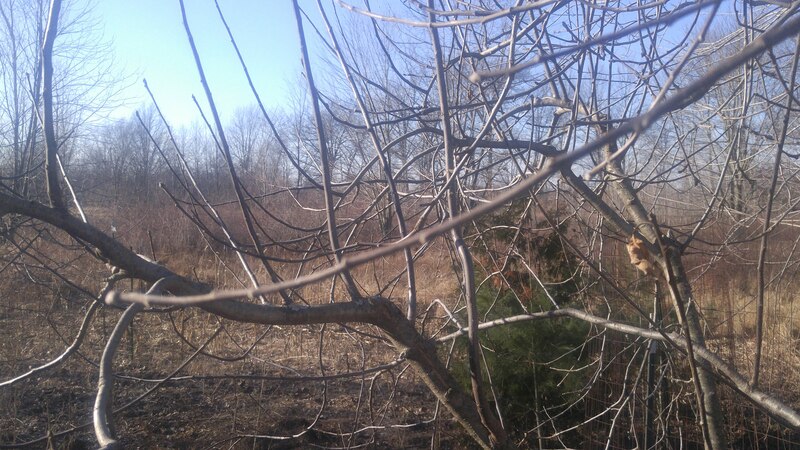 Maybe you’ve seen pruning being done in large commercial orchards as early as February. They prune that early because of the sheer number of trees that need to be pruned and don’t have the time to go through the orchard twice.